4. Why is psychoanalytic group therapy so effective? There are many reasons why this form of psychotherapy is of outstanding value in attaining emotional insight and maturity. In a group the members work through their problems in a true-to-life situation of constant personal interaction. They soon become aware of similar emotional difficulties in others. By understanding the feelings of his fellow members, the individual gains quicker insight into his own emotional problems and reactions. His psycho-therapeutic progress is continually stimulated by observing, experiencing, and sharing in the achievements made by the other group members. Constant dynamic relations with the group help the individual to give up over-dependency on the psychoanalyst, which would otherwise tend to prolong the process of recovery. Another important element is the relatively low cost of group psychoanalysis, which eases the financial burden often created by other methods of intensive therapy. An outstanding factor in the beneficial results of psychoanalytic group therapy is the multitude and variety of the interrelationships that take place in such groups. If a person sees the therapist only for individual sessions, he can react merely to a single individual on whom he projects emotional patterns established in childhood (transference). The emergence and understanding of these patterns and reactions are a prime factor in a successful analysis. Therefore, individual therapy alone might be restrictive, since it cannot arouse the whole range of deep emotions buried within the person. In group, however, the different personalities of the male and female members evoke a multitude of diversified emotional reactions and provide a number of personalities to whom the person reacts. In doing so he will come to understand his own feelings, behavior patterns, and conflicts. In the individual session the analyst is limited by the person’s subjectively colored reports of incidents and emotional reactions to them. In the group situation, however, the analyst and the group can clearly and objectively detect the manner in which each person’s defensive and emotional patterns distort his perception of reality. Thus the group member is helped gradually to achieve insight into his own deviations from objectivity. People who have undesirable personality traits and behavior patterns can be better helped to overcome these shortcomings in groups than in individual therapy. After all, the psychotherapist is limited in pointing out such flaws to the patient, since in doing so he might cause offense and harm the therapeutic relationship. However, undesirable characteristics of an individual will often become ap-parent through group interaction, and group members will more freely point them out. The underlying causes can then be analyzed and worked through. Because the group situation is more like the outer world we live in as contrasted with the sheltered protection of the private session, any emotion expressed and worked through in a group constitutes a direct step forward. Personality changes thus achieved tend to be more permanent and definite. 5. Should I join a group even though I feel uneasy about it? Many persons initially object to the idea of going into therapy together with other people, either because they feel that they will not be able to speak about their problems or because of an inner dislike or fear of people. But it is necessary to remember that such fears are directly connected with their problems. Therefore it is most ad-vantageous to work through these fears rather than avoid them. Almost invariably they diminish after a few group sessions. Some people have the erroneous impression that psychoanalysis in groups—because it is less expensive—is more superficial than the usual individual analysis. These persons may want only individual sessions in order to have the entire time and attention of the analyst, or they may state that they do not wish to be bothered with “other people’s problems.” In therapy, however, what may seem to be more gratifying—or less difficult—and what makes for the most effective and intensive method are often two different things. 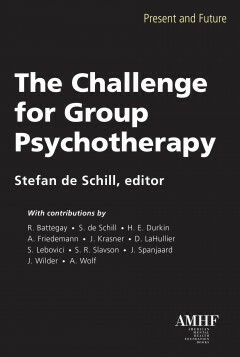 Even though the extended duration of group sessions allows each person ample opportunity to express himself, it must be stressed that the effectiveness of any psychotherapeutic technique is not in direct ratio to the amount of words a person utters. Speaking about the problems of which we are already aware is only of minor significance. A far more important task of therapy is to bring into consciousness the intense emotions which are unknown to the person because of having been repressed in childhood. Being unaware of these blind spots, we cannot directly focus on many of the areas with which analysis has to deal. However, our deeper feelings are inevitably elicited as we react at any given moment to the ever-changing group situation created by the expressions, behavior, and interaction of the members. The success of therapy greatly depends upon the extent to which repressed emotions are stimulated, brought to awareness, expressed, and worked through. Psychoanalytic group therapy often stimulates feelings more intensively and extensively than do private sessions and may bring into the open important areas of emotional disturbance that might not otherwise have been revealed. 1. What should I do in the group? In the group you have an unusual opportunity to express your real thoughts and feelings. There is no necessity to force yourself to behave one way or another. Some people, new in the group, participate actively from the beginning; others may remain silent for a while. Whichever tendency you may have, observe what the others are doing during the course of the session. Become aware of your feelings throughout the meetings. Try also to watch for any anticipatory feelings before the meetings as well as for those reactions which you may experience at any time after the sessions. Sooner or later you will want to express them in the group. If, however, you have difficulty in verbalizing some of your feelings at the time they are experienced, you may be able to do so at subsequent meetings. Should the inability to speak continue, it will be of value to express these feelings in an individual session with the analyst. The first phase in therapy includes the task of learning to identify and clarify feelings. As strange as it may seem, many people are frequently unclear about their real feelings and confuse them with “opinions,” “values,” and “intellectual concepts,” which are more often than not mere defenses against and rationalizations of their real feelings. A number of sessions will pass before you can become fully aware of what is really going on in the group. As you participate more and more you will begin to sense what the group and the analyst are working toward. You will gradually grasp the underlying significance of the procedure and become emotionally involved. The situation is like that of watching people dance and then dancing yourself—only as you actively participate do you realize its essence. Consequently, have patience for at least the first four to six weeks. For a number of people, the initial sessions may be somewhat difficult; they may feel a strong impulse to abandon the group for various reasons, such as resenting or disliking some of the members. No matter how strong these feelings are, it is important not to give in to them but to understand that their full discussion in the group, or in an individual session, will provide valuable material for deeper insight and self-understanding. You will notice that the group members do a number of things: they speak about past and present experiences, problems, thoughts, and fantasies that are emotionally important to them; they speak about feelings experienced at previous meetings, between meetings and—most of all—during the present meeting; they state their feelings about each other and the analyst. Many of these emotions may appear irrational to you. However, you will soon come to realize that feelings follow their own special logic, and the group’s tolerance of any apparent irrationality will help you to discover and express such feelings of your own. The group members also bring up dreams and discuss them, since dreams are a vital factor in understanding a person’s emotional problems and his ways of dealing with them. Some people feel that they want to hide some of their thoughts and actions from the group because they seem shocking, embarrassing, or ridiculous; or they may not want to hurt another member’s feelings or incur the dislike of anyone in the group. Be sure to express any such reluctance because the truthfull expression of your feelings is of primary importance and an absolute necessity for progress. One has to realize that this is not a customary social situation. Here the expression of negative feelings can be most helpful to the other group members as well as to yourself. If you should repeatedly feel blocked in the group and unable to express yourself, or if your mind becomes blank, your analyst may suggest that you prepare mentally beforehand a list of emotional experiences, dreams, and ideas you previously experienced and which you intended to discuss at the meeting. If you go blank just the same, you might write such items down and use this memorandum in the group. However, spontaneous reaction in the group will usually be of even greater value than prepared material. As you gradually work through your tendency to block and find spontaneous expression easier, you will be able to dispense with these props. Remember you asked for professional assistance because of your emotional problems and not because you wanted the enjoyment of intellectual discussions. Intellectual understanding alone does not bring about lasting change. Deep emotional understanding and progress will come about only by turning your attention inward in order to become aware of your feelings and reactions which stem from childhood. Therefore, it is most important that you be attentive to your reactions in any given situation arising in the group and try to understand the emotional forces at work. This may require some concentration and effort on your part. The continued expression of emotions provides a basis for the necessary therapeutic work which will follow, weakening the unconscious forces that have hidden the deeply repressed feelings and conflicts. As these gradually emerge they become more understandable and manageable. 2. How about my relationship with the analyst? It is of utmost importance that you bring up all your feelings toward the analyst, even though this may be difficult at times. Much of your psychotherapeutic advance will result from understanding the causes for the multitude of frequently changing feelings which are stimulated in your relationship with the analyst and the group members. Even though these feelings may at times appear embarrassing, irrational, or hostile, their frank expression is of great value. If for some reason you are repeatedly unable to verbalize these thoughts in the presence of the other group members, bring up this material in the next individual session. Also, when you express feelings about the analyst in the alternate session, be sure to bring them to his attention in the subsequent regular session. Many times, seemingly against your will and without your conscious knowledge, inner mechanisms will work against your progress in therapy as painful areas are approached. Frequently such reluctance to delve deeper takes the manifest form of negative feelings against the analyst, the therapy, or both. These feelings may be based on earlier attitudes toward parents and other persons in authority. Your reactions may be so strong that unless the analyst is given a chance to work them through with you they may actually induce you either to forsake professional help completely or, as an escape from the threatening situation, to seek another analyst. It may require a good deal of self-discipline not to give in to such feelings, which at the time may seem quite reasonable. Doubts may also come up when you feel that you are not making visible progress. It is inherent in all forms of psychotherapy that periods of standstill or even setbacks occur. Most often these periods will be only of limited duration. Old patterns of feeling and behavior are tenacious and the total line of progress includes many ups and downs. Often an old pattern will recur when a hidden wound within your unconscious has been touched upon by therapy, or when the next step forward seems too frightening. Yet these difficult periods are an important part of psychotherapy and provide valuable material for further progress. Such resistance comes up in all types of analysis, including group therapy. To become aware of these blocks, which may take many forms, and to work them through is a most significant factor in your progress. 3. What about my relationship to the other group members? It is most important that you become aware of and express your feelings toward your fellow group members. Notice also their emotional reactions toward you after you have expressed yourself and see how their reactions affect you. The significance of these reactions may appear in what is said, but sometimes even more in how it is said. Often a person’s behavior—which is always a most significant clue to his unconscious drives and motivations—will reveal a discrepancy or even be in direct contradiction to his spoken words. This may occur even though the person believes he has expressed himself frankly and honestly. You might also notice when a person “acts out” an emotion, that is, when his emotion finds expression in action rather than in verbalization. This might be, for instance, turning his back on and ignoring a group member he dislikes, or constantly interrupting him. Acting out also can be verbal. Two simple examples are: a group member may knowingly make false and malicious statements about another group member or the analyst in order to hurt him or may falsely claim affection for someone in group to win his alliance. Understanding the feelings underlying such actions, which are often unconscious, will be greatly facilitated if this behavior is interrupted and brought to the attention of the individual. Soon you will become aware of the emotional patterns in one or more of the members as they automatically react in an irrational way to certain situations. Your awareness will gradually become enlarged and you will develop such insight into your own behavior as well. It is customary for group members to call one another by their first names. Everything said in the group by any of its members must be held strictly confidential and any knowledge gained about them, including their identities, may not be divulged to any outsider. With regard to fees, some analysts charge the same rate to all group members. Others adjust the fee to the income of the member. Thus it is better for group members not to discuss fees, since this may foment unnecessary feelings of jealousy or inferiority. However, once such a situation has arisen, it is desirable to air and discuss fully the feelings aroused. 4. Shall I tell others that I am in group psychoanalysis and what happens in the sessions? It is entirely up to you whether you want to let others know that you are in analysis. It is wise, however, to use judgment about whom you confide in. Some people still have prejudices against psychotherapy. Others, who may not be well-intentioned toward you, may try to use such knowledge to hurt or annoy you. Well-informed and mature people, however, will respect you for having chosen a path of self-improvement and inner-growth. For a number of reasons, it is always undesirable to speak with outsiders about what happens in analysis—private or group. First of all, you will express to them emotional reactions and evaluations that should be saved for a sessions from which you might derive therapeutic benefit. By expressing such feelings to someone not in the group you will be less inclined to bring them up in your next session, and valuable material may be lost. Furthermore, in the psychotherapeutic setting one is dealing with unconscious processes of all kinds, which will most likely be misunderstood by an outsider. Another danger exists for those who regularly tell a friend, parent, intimate about the content of their sessions. A time will come when unconsciously they will refrain from bringing up certain material in the session just because they do not wish to repeat it to their habitual confidant. The very process of analysis thus becomes stifled and meaningless. 5. What else can I do to help my progress? Since your emotional structure and behavior patterns have been deeply ingrained since childhood, continued effort over an extended period of time is required to bring about positive and lasting changes. Coming regularly to the sessions is only one of the factors necessary to your progress; your efforts between, as well as during, the sessions are also of major importance. As you know, the task of the psychoanalyst is far from easy. An important part of his work, upon which much of the success of therapy depends, is to understand your unconscious conflicts and motivations. His efforts in this direction require the greatest possible honesty on your part. If necessary material and information are withheld, changed, or embellished, then a serious obstacle to effective analysis has been created. Many people enjoy being in therapy and the particular group to which they belong. However, for a period of time some may dislike the group meetings. Such people should bear in mind the therapeutic purpose of the sessions. Their discomfort during these limited hours is a relatively small price to pay for emotional gains that will enrich their lives. Furthermore, the very discomfort experienced is a valuable clue to underlying emotional problems. As you gain more and more insights, it is important that you attempt to make them meaningful in your life, applying them constructively in your day-by-day battle against the old patterns. If you merely content yourself with an intellectual understanding of how it came about you will have gained little except, perhaps, a good excuse for being neurotic. You will observe that some insights gained during the sessions will slip away quickly, sometimes only seconds later. If this occurs, it is important that it be brought to the attention of the group, so that the causes of such forgetting will be discovered. In addition, try to make a conscious effort to remember any insights you gain. Some therapists advocate writing them down after sessions, if necessary. Aside from following as closely as possible the various points mentioned so far, there is an additional way to help your progress. As you know, dreams and fantasies are of great value in psychotherapy. Therefore try to remember your fantasies, daydreams, and particularly your dreams, and discuss them in the group sessions. Dreams are motion pictures of the forces moving in your unconscious; psychoanalysis is needed to decipher their real meaning. You will do best, when you wake up, to lie still and attempt to recapture the dreams you have had. Do not open your eyes until after you have recapitulated them. Some people will find that they tend to forget dreams, in whole or in part, even though they have recalled them upon awakening. If your therapist agrees to this procedure, write them down before inner forces that work against deeper awareness erase them from your memory. In the period just before falling asleep the mind is in a more suggestible state and the unconscious tends to continue working with the impressions it receives. Therefore, if you have difficulty remembering dreams after awakening, try the following technique: at night, just when you are falling asleep, tell yourself in an effortless way that you are going to have dreams and that you will recall them as you awaken. You may not achieve results the first few times, but chances are that shortly you will. 6. How will I know when my therapy is finished? Many times during therapy people may experience a period of well-being such as they have never known before, or lose painful symptoms that they have had for some time. In response to these improvements they may consider themselves cured and decide to abandon therapy. Actually, permanent and sufficiently deep structural changes may not yet have occurred in all areas where improvements are necessary. In many cases resistive forces will be the underlying cause for this feeling of well-being and, more often than not, unconscious resistance to anticipated anxiety—and not the obvious satisfaction over improvement achieved—will be the real cause for the decision to leave. The discontinuance of analysis then makes it possible to avoid previously hidden painful feelings that are now ready to emerge. All this points to the fact that no one can be the judge as to when his own therapy should terminate. Your analyst will decide with you when this time has come. Whenever you wish to leave, discuss your intention frankly with your analyst and the group. They will be able to work with you to determine whether it is a result of resistance to further necessary change or a justified decision based on the solid ground of mental health achieved. de Schill, S. (1958), Introduction to Psychoanalytic Group Therapy. New York: American Mental Health Foundation, 1969, 6th rev. ed.